Supreet Kaur was reading the 10 a.m. news for IBC24 when a reporter called in a "breaking news"
The news anchor on a local news channel in Chhattisgarh on Saturday read out a “breaking news” story of a car accident despite knowing that her husband had died in the same accident. 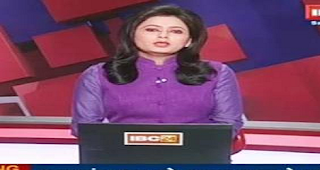 Ms. Supreet Kaur (28), a news anchor at the IBC24 news channel in Chhattisgarh, was reading out the news at 10 a.m. on Saturday as a part of her daily assignment when the channel's Mahasamund district reporter Dhananjay Tripathi called to inform her about the “breaking news” of the accident. “She did not know it was her husband’s car until our reporter mentioned the number of the vehicle. However, she did not lose her composure even after knowing that her husband was no more. She completed the bulletin, walked out of the studio and then broke down,” said Tehsin Ziadi, a colleague of Ms. Kaur in IBC24. Three persons were killed in the early morning accident in Mahasamund district, including Ms. Kaur’s husband, Harshad Kawade. Ms. Kaur has been working for IBC24 since 2009. She and Mr. Kawade got married only last year.